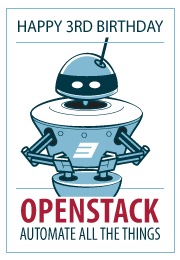 Happy birthday OpenStack — you’re three years old today! Like most three-year-olds, you’re a bundle of energy and you’ve accomplished a lot in a short time. Congratulations to the OpenStack Foundation and to everyone who has contributed to the OpenStack project. It’s been exciting to watch the community grow, to see user interest spike, and to help RightScale customers manage their OpenStack private and public clouds. We’ve seen firsthand how the power of OpenStack’s open cloud computing architecture helps businesses maintain flexibility as they build and execute their cloud strategies. RightScale works with customers who are building OpenStack solutions, and enables businesses to manage OpenStack private, public, and hybrid clouds, improve their agility, and implement application automation. RightScale also works closely with OpenStack partners such as Rackspace, and we support and recommend the Rackspace private cloud configuration as a means to deploy an OpenStack cloud. We have built OpenStack integration into the RightScale Cloud Management platform so that you can connect your OpenStack cloud to such public cloud as Rackspace, AWS, Windows Azure, and Google Compute Engine. One of our customers, Samsung SDS, shared details of its OpenStack implementation during a keynote presentation at the RightScale Compute conference - watch the video starting at 47:00. Samsung SDS Vice President Richard Kaufmann presented his company’s implementation of a hybrid cloud that uses OpenStack as its private cloud operating system and RightScale as the management layer. Samsung SDS created the hybrid cloud as a global, elastic infrastructure to support unpredictable business-to-consumer service traffic. It also hosts such applications as custom portals, a business support system, and system management tools. Samsung SDS turned to a hybrid cloud architecture to meet its security requirements and fulfill the need for predictable high performance despite unpredictable loads. The public cloud provides elasticity in an architecture known as cloudbursting, where application workloads run fully in a private cloud until they grow beyond some threshold, after which the application tier bursts into a public cloud to take advantage of additional compute resources. A load balancer sends traffic across both private and public clouds when necessary. Although cloudbursting can be challenging to implement, Kaufmann says Samsung SDS makes it work by making sure that the latency from private to public cloud is similar to that between two public cloud availability zones, and it deploys its applications in data centers in Virginia, where bandwidth is cheap. The end result is that Samsung SDS is able to bridge services from its OpenStack private cloud to a public cloud. RightScale serves as the organization’s “orchestration partner,” enabling the company to avoid lock-in with any single public or private API set. If you’re seeking information on how to manage your private or hybrid cloud, check out RightScale Cloud Solutions Engineer Ryan Geyer’s video presentation “Techniques for Managing Your OpenStack Cloud” at the recent OpenStack Summit in Portland. We're looking forward to celebrating the continued expansion of OpenStack with our customers for many years to come. RightScale will be at the OpenStack Summit in Hong Kong in November — please stop by and talk with us or join one of our sessions.